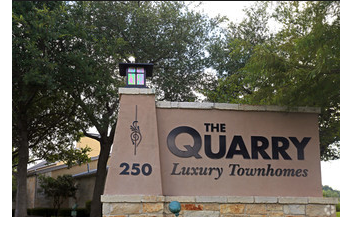 ​ SAN ANTONIO – San Francisco-based real estate investment company (Bay Area Investor Hamilton Zanze) has acquired the 150-unit Quarry Townhomes. The property, located on 6.5 acres in the Alamo Heights area of San Antonio, consists of 175,872 net rentable sf across a mix of one-, two- and three-bedroom units. Unit occupancy was 89 percent at the time of the transaction. The company plans to undertake improvements at the property including interior unit remodels, clubhouse and courtyard renovations. This is the sixth property now held by the firm in San Antonio, all acquired in the last two years. ​See ​also: San Antonio-New Braunfels Multifamily Market Research.